I’m not sure if this is because a recent update, but I have not changed any internal settings on my dilapidated laptop. Any thoughts on what I can test to find the issue? Please give some info about your machine. Message: Unable to show advanced data. Required tool glxinfo missing. Ok, you have a Realtek 8723ae, which should work out of the box. Failing that, have you tried the solutions listed in the Arch wiki? I have looked at the document you sent, but I have no errors related to powersave. Wifi was working great until a recent update. I guess I am of the opinion right now that something has changed. You are correct, out of the box, my wifi worked flawlessly. Maybe you have accidentally disabled wifi? Is there a physical switch? Or are the wireless network connections still set up OK? Wifi password’s OK? If that doesn’t help, you could try the LTS kernel. @manuel Nope no physical switch on this laptop for wifi. Just an internal setup. I used to have it setup as a dual boot, and with that I could test both sides. Alas, I eliminated windows from this machine recently and made it a pure linux one. 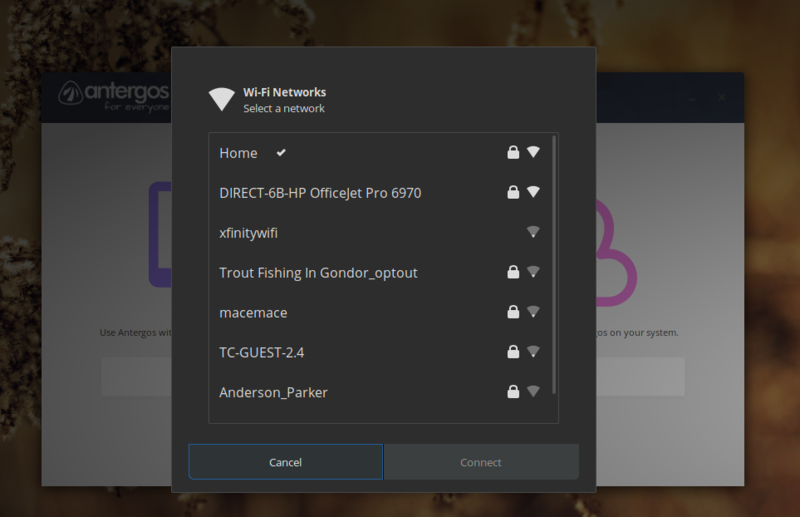 I could boot up with a live antergos disc to see if wifi works there. Can I change Kernels without reinstalling Antergos? In my case the networkmanager 1.14.6 stopped connect, I downgraded to 1.14.5 then now 1.14.7 is available which works without any problem. Could it be same problem maybe? and after reboot, select LTS kernel from the additional options of the grub menu. BTW, downgrading may help, but that’s just a temporary workaround until the real problem is resolved. I will try falling back to 1.14.5 as a test. That was a bust, still no wifi networks show in the network manager. The 26th on those updates sure sounds familiar though as far as when I first noticed I didn’t have any networks available. EDIT: No luck there either. I will download a live copy of antergos at work today and burn it to a flash drive just to test and see if I have wifi with an “unchanged” copy. Thanks to everyone for trying to help. I did scan the journalctl for a bit, even grepped it for ‘wlp2s0’, no clues yet. But did you try the LTS kernel? @manuel No, not yet. I just kind of feel like this is some package upgrade that got me. I am trying to figure out what the package in question is. Here is a screen shot from the live antergos usb. Connected to my network no problem. So at least I know this is not a hardware issue. I will try the kernel change. It may well be a kernel update issue, that’s why testing with another kernel might help. @manuel I installed the LTS kernel and went into the options menu while in Grub, I did not see any specifications as to which kernel would be loaded. Do I need to manually add an additional option in the grub config file to boot into the LTS kernel? @manuel LTS kernel did not fix the problem, however, the “fallback” selection in grub does have working wifi.